Contents: A soft pretzel and mustard, chocolate milk, fruit cocktail, corn and pizza. 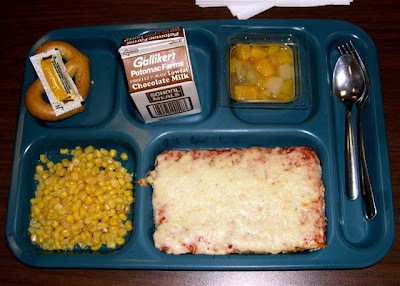 Boy I loved school pizza. It was like a soft cracker crust. Really different than anything you get out. Almost always hamburger. i remember that pizza....i have to say my reaction to it was not so positive. bleck!